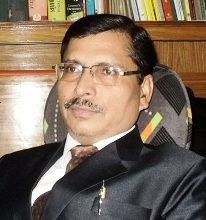 C.L.Khatri, a reputed, perceptive critic and editor of Cyber Literature and several anthologies of criticism, is a well known voice in Indi an English poetry. He is a bilingual poet writing in English and Hindi. His four poetry collections in English are Kargil (2000), Ripples in the Lake (2006), Two- Minute Silence (2014) and For You To Decide. He was awarded Michael Madhusudan Academy Award for his poetry collection Kargil in 2002. His poems are widely published, anthologized and translated in different languages in India and abroad. He made his debut in translation with the English translation of Chandrakanta, a Hindi classic novel by Devakinandan Khatri. He is elected Editor-in-Chief: The Indian Journal of English Studies of AESI. Currently he is Professor, Dept. of English, T.P.S. College, Patna.